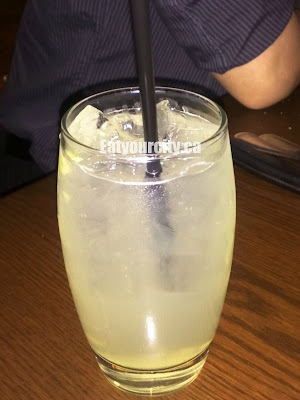 Its been ages since I've been to the Keg mainly because of a bad experience involving a super charred and overcooked steak a while back at the Whtye Ave location, but we figured we'd give it a whirl again - this time we went to the South Commons location. We were greeted with dark wood tables and chairs, a bustling dim dining room, cheerful lit fireplaces and friendly, knowledgeable staff. 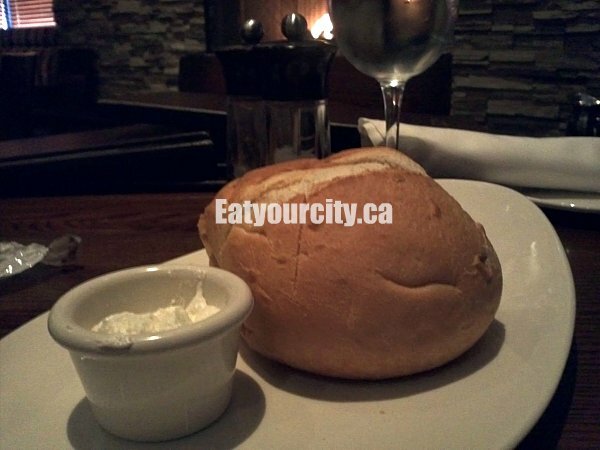 A complimentary loaf of bread was brought to the table, and surprisingly it was hot and steaming. We noshed on it while we decided what to have for dinner. We started with Calamari as we had heard it was tasty. 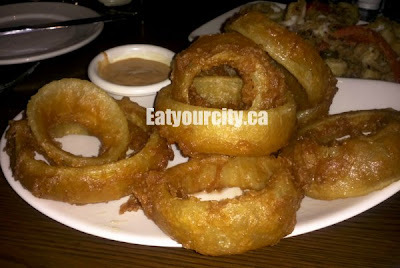 Lightly fried to perfection, along with deep fried slices of red peppers and jalapenos for color. this was a pretty large plate of calamari - perfect for sharing! It came with a spicy sweet ginger garlic sauce and sesame-soy based dipping sauce. We shared a plate of gigantic House-Crafted Onion Rings, well cuz my boyfriend was craving onion rings :) They were deliciously crispy and seasoned, though they could have been more well drained of grease. 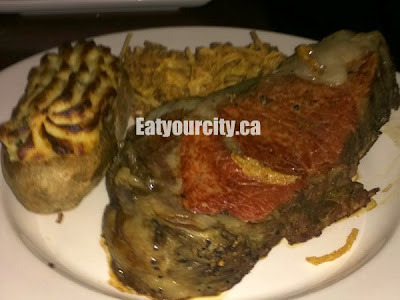 My bf went with the Filet Mignon wrapped in applewood smoked bacon with a side of double baked potato. Sadly, the bacon wasn't crispy, but did its job keeping the meat moist. 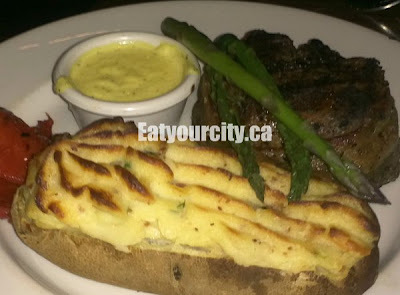 Though not as silky in texture as Ruth's Chris Steak House, we like how the steak was evenly and well seasoned. The double baked potato was just swimming in butter... mmmm! Our friend stepped up and had the massive Prime Rib. Seasoned well with The Keg's signature rub and slow roasted. Its only available usually as medium rare-well done as it is done in batches. Tender and flavorful only as a prim rib cut should be. He had a double baked potato with onion straws as his side, and the waiter kindly brought over extra butter and crispy diced bacon bits for him to add to his potato. Can't go wrong with more bacon! 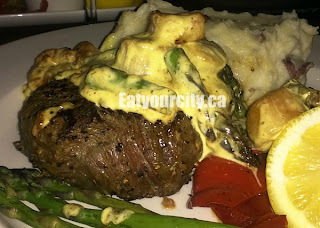 I went with the Sirloin Oscar, instead of my usual prime rib steak I prefer, as they didn't have any prime rib rare enough to my liking. This 8oz top sirloin was seasoned well, grilled to my liking, and topped with a few medium sized shrimp, scallops, asparagus and a creamy Béarnaise sauce. Not as rich and seafoody as Von's Béarnaise sauce, but still an indulgent sauce to go with my steak. I had roasted garlic mashed potatos as my side, and it was good, but as I love garlic, if they added in more roasted garlic, it would have made these mashed potatos really shine. Not having much room after eating so much meat, we packed up our leftovers and went with their mini desserts - "Sweet minis" Passion Brulée. 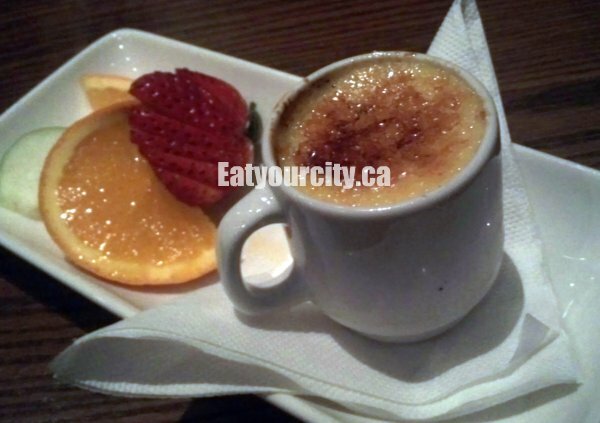 This passion fruit infused crème brulée, as promised was served in a small espresso cup and though it strong notes of passionfruit and a nice a toasted sugar crust that cracked nicely - it fell extremely short in the texture arena. The interior of the brulée was paste-pudding like rather than a silky smooth creamy. Ick. It may have been the reason why our meal didn't sit well with us shortly after. We chose eat the fruit it came with instead. Overal, a good place to have a well seasoned steak with the fixings. Though they need to work on their Brulée.